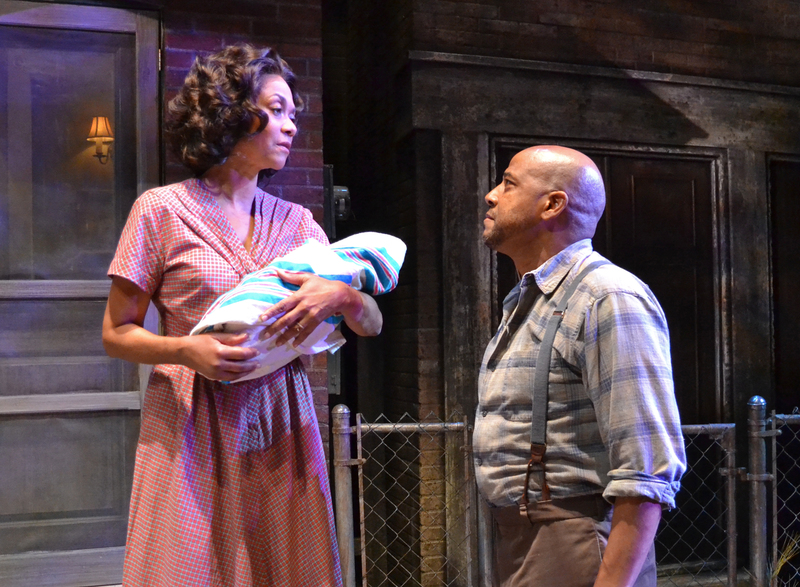 Rose (Karen Stephens) confronts her husband, Troy (Lester Purry) in Palm Beach Dramaworks’ riveting production of August Wilson’s Fences. 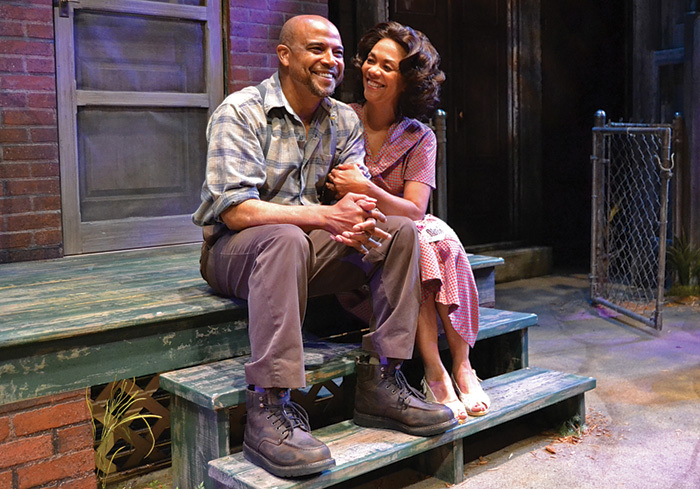 WEST PALM BEACH, Fla. — Toward the end of Palm Beach Dramaworks’ breath-stealing, intense and all-together riveting production of August Wilson’s masterpiece, Fences, fierce thunder claps and intense lightning punctuate a highly-charged scene. Even so, Purry makes these and more traits arise organically from Maxson’s past and current circumstances. These tragic flaws seem as much a part of him as his limbs and organs. As a result, Maxson never comes across as someone trying to be spiteful for spite’s sake. Purry’s acting is, at times, intimate and touching. This is especially the case during tender scenes with his long-suffering, yet faithful wife, Rose (a terrific Karen Stephens). During other times, Purry’s portrayal is large in scale. In fact, one might say it is a towering performance, Shakespearean in scale. But whatever emotion the actor conveys, it’s always credible. Emotions and actions seem spontaneous. The play is part of Wilson’s “Pittsburgh Cycle” or “American Century Cycle.” In one of theater’s highest achievements, Wilson wrote one play for each of the 20th century’s decades, chronicling the African American experience in each. Except for one work, Ma Rainey’s Black Bottom, depicting black life in the 1920s and set in Chicago, all cycle plays are set in Pittsburgh’s low-class Hill District. Maxson, a garbage collector and former thief who spent time in prison, takes out his frustrations primarily on his teenage son, Cory (Jovon Jacobs). 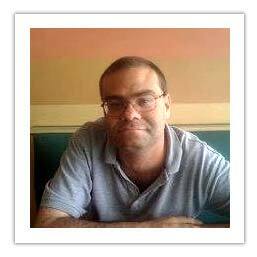 The teen, despite his color, has opportunities his father never had. That is primarily because the younger Maxson is growing up during a different time period. Add the generational gap between father and son, and you have seeds which can sprout jealousy and even resentment. In his cycle, several of Wilson’s plays center on the spiritual, ritualistic aspects of the African American past. However, realism is predominant in the highly symbolic Fences. It is specific to African American culture, yet universal in its themes. Certainly, you don’t have to be black or even familiar with the other cycle plays to identify with the ideas presented in Fences. Indeed, this is a play that can stand by itself. You can easily see yourself or someone you know through these characters. Surely, some will recognize herself or someone she knows through Rose. And as Stephens expertly embodies her, how could you not? The actor lends Rose a charming and loving demeanor. It is one that can easily explain why Troy chose to marry her and remain married to Rose for nearly two decades. Stephens’ Rose sings sweetly while hanging laundry on a clothes line. Further, when she witnesses one of her husband’s foibles, she looks at him with a wry, knowing and amusing glance. It’s one that clearly communicates that, through 18 years of marital bliss, Rose has come to know Troy as though he were her identical twin sibling. In addition, Rose must suddenly, yet seamlessly segue from soft-spoken devotion to shocked dismay and anger. We never sense this change coming under Stephens’ portrayal. But when it does come, we practically feel as though we’re watching two different people. The consternation Stephens conveys after Troy’s unexpected revelation is difficult to watch. The pain and teary-eyed expression suddenly etched into Stephens’ heretofore sunny face and the bitterness escaping her voice will likely leave you crying and gasping. Moreover, your protective instincts might kick in during a scene in which Troy becomes physical with Rose. Rose (Karen Stephens) and her husband, Troy (Lester Purry), enjoy a happy moment.